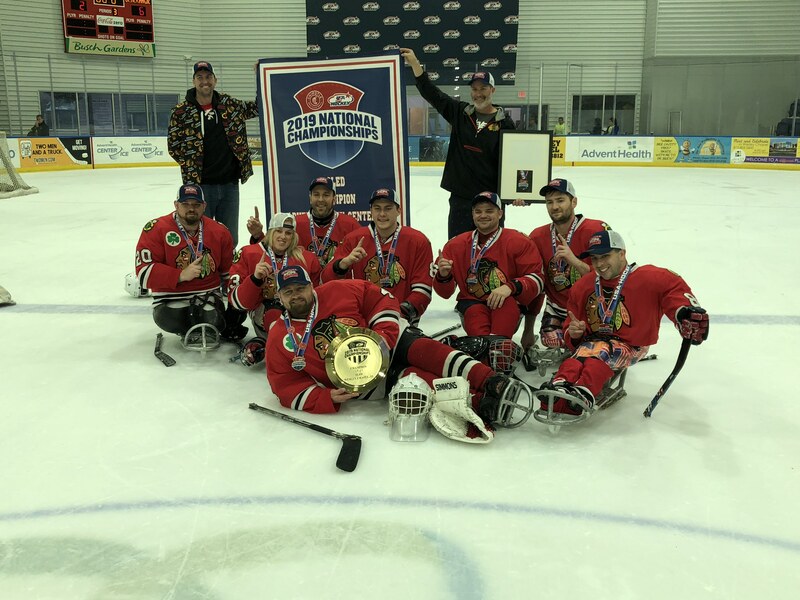 WESLEY CHAPEL, Fla. — Chicago Blackhawks coach Derek Daniels knew that if his team (click here for roster) keyed on the Gaylord Wolfpack’s Declan Farmer and Jack Wallace, his team stood a very good chance of winning the USA Hockey Sled Hockey National Championship on Sunday. In containing the two Paralympic gold medalists, that is exactly what happened. Brody Roybal scored three goals and Justin Kreger came up with a number of big saves in leading Chicago to a 6-2 victory over the Wolfpack at AdventHealth Center Ice. Chicago scored twice within 30 seconds in the opening period to take a 2-0 lead. Roybal scored the first of his three goals at 4:14. Wolfpack goalie Ryan Sparks appeared to have made the save on Roybal’s shot from the slot, but the puck trickled past Sparks and slid over the goal line. At 4:44, Roybal set up Travis Dodson to make it 2-0. That would be the score after the opening period. In a second-round game Friday evening between the teams, Roybal factored in nine of his team’s goals — scoring six himself — in a 10-4 win. Indeed, Chicago’s 38-year-old goaltender, Justin Kreger, had quite a game. Though the Blackhawks keyed on Farmer and Wallace, the Wolfpack managed to get a few prime scoring opportunities. Alas, Kreger often had the answer, though he gave much credit to the guys in front of him. The Blackhawks did their job with building on the lead. Dodson roofed a shot over Sparks for his second goal and what proved to be the game-winner at 4:47 of the second period to make it 3-0. With Chicago leading 4-0 in the latter stages of the third period, the teams combined for three goals in 15 seconds. The Blackhawks emerged from that flurry with a 5-2 lead. At 11:27, Farmer had an opportunity to bring the Wolfpack to within two, but Kreger’s glove save on a low shot ticketed for the far side prevented that from happening. Joseph Gugliotta left no doubt as to the outcome when his goal with 2:26 remaining accounted for the final margin. The roll Roybal referenced was Chicago winning the NHL Classic in February and the Wirtz Cup in March. The Blackhawks made it a hat trick in Wesley Chapel.